Like most of the nation, last weekend I watched the Red Bull Stratos live stream of Felix Baumgartner’s record breaking jump. For me, one of the best parts of the stream was the moment when the cabin finally depressurized and the door slid open. Suddenly, you could see both vastness of space and the bright blue curvature of the earth over his shoulder, and it took my breath away. It had always been a dream of mine to see the earth like that, and watching Felix’s live stream got me so amped up, I couldn’t hold off any longer. I knew I wouldn’t actually be able to travel to outer space, but I still wanted to somehow capture the awe of it myself. I decided a video camera rigged to a weather balloon would be a great start. 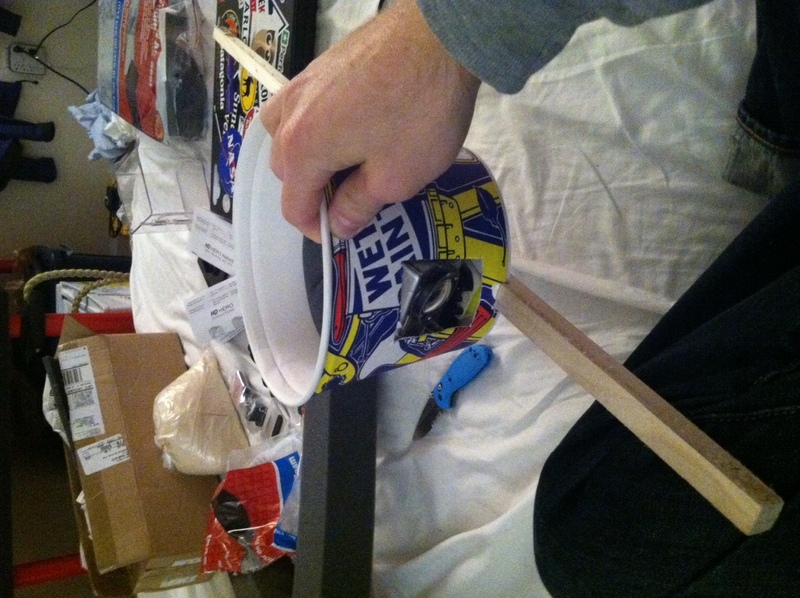 I found a big weather balloon on Amazon for less than $50, a parachute for $30 and then assembled some supplies from the local hardware store to build the capsule. The video recording device was a GoPro HD Hero that I found for cheap on Amazon. But getting the rig to float across the sky and record video along the way was the easy part. Getting it to land safely and then recovering the camera would be the hard part. I knew the balloon was probably going to ascend to almost 100,000ft (about 19mi up) before it would pop in the vacuum of space and the parachute would carry it in for landing. But I expected the rig to drift pretty far from wherever it was launched. My biggest concern was that it would land somewhere in the Atlantic Ocean and I’d never be able to recover the video. Since the prevailing winds generally blow west to east, I knew we couldn’t launch from the Boston area or it’d end up in the sea for sure. But knowing it wasn’t in the ocean wasn’t good enough. I found a balloon trajectory forecast site that gave me a pretty good sense of which way it would drift, but that still wasn’t enough precision to actually track it down. It turns out it is very hard to track a device that is tens of thousands of feet off the ground, but the best solution I could find was Garmin’s GPS tracking device, which uses cellphone service to broadcast its GPS location, which could then be viewed from Garmin’s website or on a mobile app, in real time. With all that and a bit of duct tape for good measure, we were ready to go. Sarah and I hit the road at 6am so that we could get west to launch early in the morning, when the winds were calmest. The launch site was a small Hannafords store in North Brookfield, which I chose because it opened early and had a “Bring Your Own Balloon” policy for their helium tank. 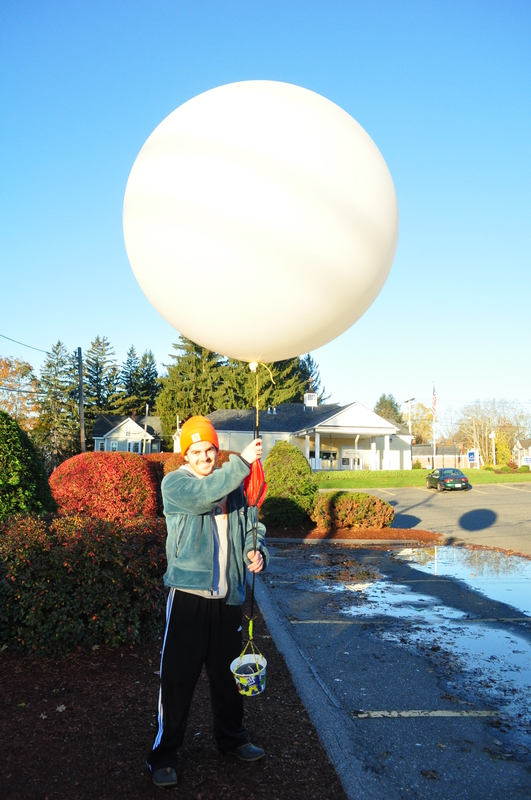 We ran through the pre-flight checklist, and then, at 7:54am, released the balloon with its video-recording payload. It ascended quickly and disappeared in about a minute. And then, we waited. The Garmin device stopped updating its location in the app several minutes after it took off, either because it had risen too high to reach the cellphone towers, or else it was in an area with bad service. This was very frustrating since I had hoped to be able to watch it travel most of the way and try to follow along underneath it. Sarah and I went for a hike while we waited, enjoying the fall foliage. Afterwards, we decided we’d start to drive back east, towards Waltham in case the balloon showed back up on our tracking system. I had heard the balloon trips often last between 2 and 3 hours before the rigs touch down again, so when lunchtime rolled around and the balloon still hadn’t shown up, I was ever more frustrated. I figured it had probably blown into the ocean and it was all a waste. But then, at 12:05pm, an email: “You Garmin device is running low on battery” That means it had checked in! And if it checked in, it must have updated its location. I quickly pulled off the highway and checked the app. 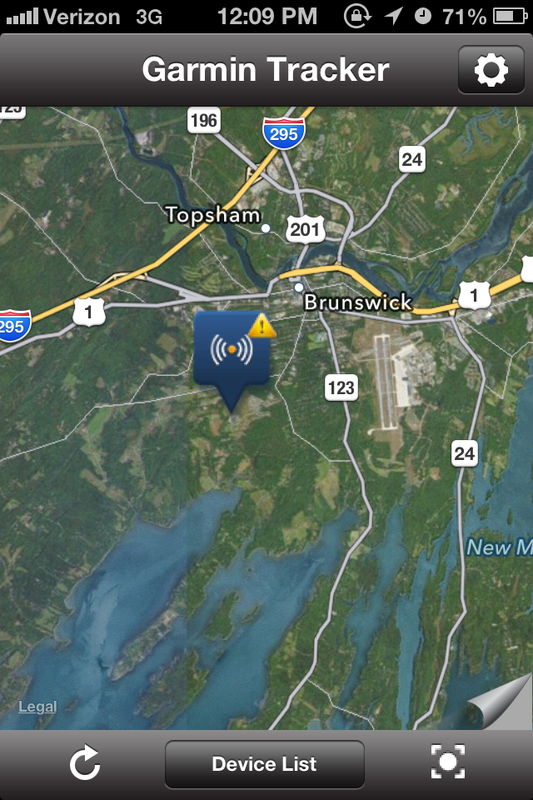 It turns out, the rig had travelled up to Maine – almost 200 miles northeast – and was currently floating across the Brunswick High School baseball field. Wait, Brunswick High School?? Like, 3 minutes down the road from Bowdoin, where I went to college? Yep. It was pretty incredible that that’s where it’d end up of all places, and I knew exactly how to get there so we jumped back in the car and raced 2 and a half hours north, to Brunswick, Maine. We pulled off the road just across from the high school. Right before the battery in the tracker died, it updated its locations say it had drifted over into the woods across the street, before coming to a rest (several check-ins in a row in the same spot). 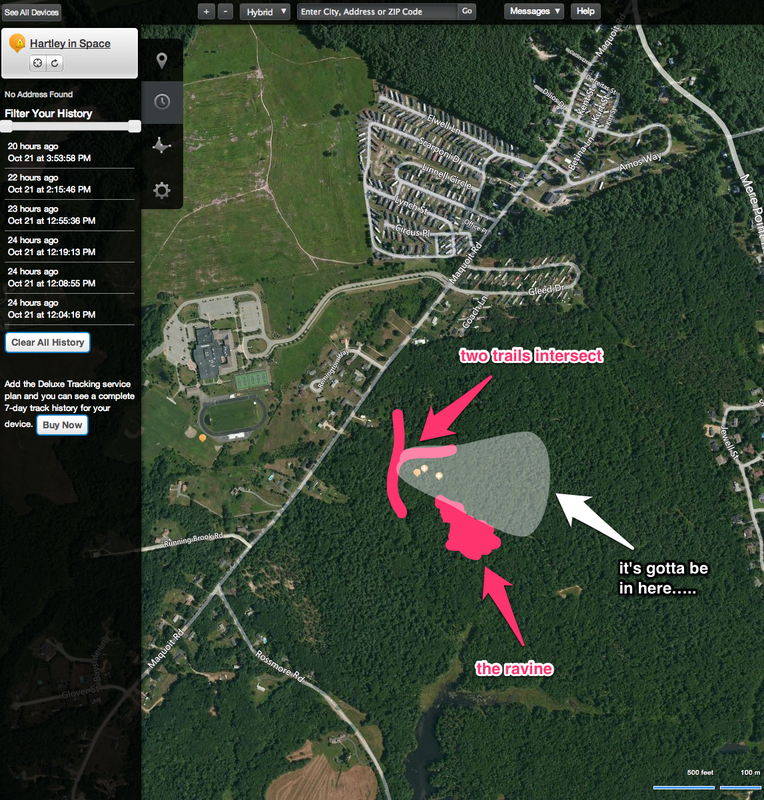 Sarah and I headed into the woods, eager to find our precious payload and recover the video. Alas, after 3 long, agonizing hours, it was starting to get dark, so we had to pack it up and head back to Boston. Unfortunately, that means we never recovered the actual video that the camera shot on its 200 mile trip through the sky and into the edge of space. Here’s as much information as I know about its whereabouts. I wrote my cellphone number on the side of the capsule before launch, in case anyone found it. But this thing is buried in the woods, so I doubt anyone will stumble across it for quite some time. There’s also a chance that the video captured the meteor shower that took place over Massachusetts this morning, which would be absolutely incredible footage from that vantage point. I really really don’t want that footage to get lost in the woods. If anyone is willing to search for it, please, please shoot me an email at hartley.brody@gmail.com I’d really love to publish the footage and give you a huge shoutout for your assistance. And if you have any questions about sending your own mission to space, I’d be happy to answer with a few “dos” and a lot of “don’ts”: @hartleybrody. Update: I’ve gotten a ton of interest from students and community members who are interested in helping me locate the capsule, which is really exciting! The orange ballon shapes are the places where the GPS checked in. The pink marks are the landmarks I noticed while hunting around, and the white area is my forecast of where I think the balloon might be. It’s possible that the rig hit a tree, knocking the GPS receiver out, and then kept travelling a little farther east. Sarah and I searched the area around the 3 orange markers pretty thoroughly, and ventured into the ravine briefly, but didn’t go much further east, or down the ravine. The parachute is a dark red color, about 2 feet in diameter. The capsule is a 1 quart cardboard bucket that’s got a blue and yellow and green design on the outside. It’s strung together with yellow parachute cord and yellow duct tape. Update 3: WE FOUND THE BALLOON!! !